The aftermath of the 2009 financial crisis is still with us, as various researchers note. The result was a wave of foreclosures that didn’t have to happen. 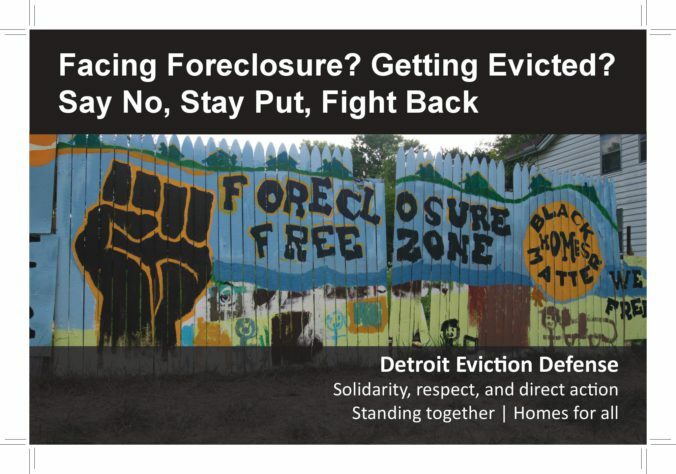 In Detroit thousands of families lost their homes through being forced to accept adjustable rate mortgages while others lost homes that their families owed for years because the applying for a poverty exemption was hidden from them. As a result, Detroit has become a city of renters, not homeowners. At the beginning of 2019, the Wayne County tax office calculates that there are 27,395 homes facing foreclosing this year, and most are in Detroit. The family is displaced. Disproportionately these families are African Americans. Severed from close-knit social networks and the stability of their place, these families suffer greater health problems and lose out on educational opportunities. The Urban Institute has documented this downward trajectory. The neighborhood loses a family and chances are that the home will become blighted. Houses bought up at the auction are often bought by speculators and bulk buyers. While some remain empty, just waiting for property values to rise, others become rentals. The Philadelphia Federal Research found that nationally institutional investors such as Blackstone, Cerberus Capital and Golden Tree converted the single-family homes they bought into rental units. While depressing homeownership rate by 28%, these Wall Street firms drove it up housing price increases by nine percent. Between 2001 and 2015 there was a 29% increase in the number of households that spend more than 30% of their income on housing, according to data from the Pew Charitable Trusts. Corporate investors own roughly 200,000 single-family homes. Publicize the poverty tax exemption. At least 40,000 owner-occupied Detroit households are eligible bur in 2017 only 5,500 applied and 5,200 received it. The City of Detroit settled with the ACLU lawsuit to publicize the exemption and streamline the application process. Make the poverty tax exemption retroactive. Given that the poverty tax exemption was hidden from residents who needed it, the exemption should be able to apply for the past years and have the interest and fees assessed on the balance removed. Last year the nation’s largest eviction database, Eviction Lab, revealed there were at least 2.3 million eviction filings in 2016. Few renters are able to go into court accompanied by a lawyer so their ability to present an argument about the failure of the landlord is quite limited. Nearly 40% of Detroiters live below the federal poverty line. Median household income is $27,83, less than half the national average of $57,652. Our unemployment rate is eight percent, again more than twice the national average. The current shutdown of many federal agencies might make the matter worse. With the shutdown lasting more than a month, housing experts fear evictions could spike nationwide because landlords who rent to low-income tenants might not be able to get rental assistance from the Department of Housing and Urban Development. Victory–Two New Homeowner Families in Brightmoor!